Discussion in 'Henshin Justice Unlimited' started by Toku Prime, Oct 14, 2018. The Kami no Kiba (God's Fang) project continues! In the news section I'd argued that it seemed like this was a prequel...and I have to eat my words because episode 0 begins with an introductory voice over that establishes that this does indeed take place after the movie (which in turn takes place after the Gold Storm Sho TV series). The movie ends with Jinga back in the Makai realm charging towards Messiah, the big bad of the original Garo series, intent on battling her for supremacy. The voice over tells us that Jinga lost that battle (a shame we didn't get to see that) and his soul drifted until eventually he was somehow reborn as a human. I'll be honest, that doesn't make much sense to me as Jinga's soul was consumed by a Horror when be became a dark knight, so do they mean that the Horror has been born in a human body? Anyway, to slightly redeem me, the rest of episode 0 really does seem like a prequel. 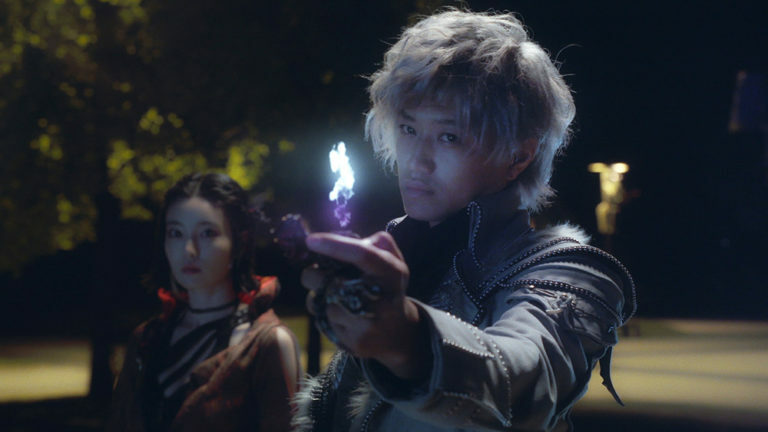 The episode jumps between a big battle where Jinga has to battle against his own parents who have been consumed by Horrors - yet his younger brother insists it is he that has been consumed - and six months later when Jinga is a rookie-ish Makai Knight hunting Horrors with the aid of the Makai Priest Fusa. Where will it go from here? What did you think of the show? Am I the only one who is really confused by the timeline of the Garo franchise (seriously, this is set in the future of the Ryuga stuff, which was in the future of the Kouga/Raiga stuff, yet everything basically seems just like the present day)? Futuristic set was only happened in Yamitera and yet everything was normal in Goldstorm, so I guess there is not much change after big event where Garo vanished for a while. But they mention about Madou tool become such rarity after that so Jinga can not be that Rookie-ish. Just caught up on the last three episodes of this and I still have no idea what Jinga's plan was, or Messiah's, or how/why he was reborn as a human, or if there was any point to this really? I'm kinda disappointed. Masahiro Inoue was more compelling reprising his role as Tsukasa/Decade in Zi-O. Somehow it feels similar with Kiba Gaiden. Basically they give a hope, this villain, actually have good reason then suddenly break it as he is evil after all. Lack of great effect, minimum costume (for horror and other character) and they are not even full 24 episode. I hope this is just for stalling time while they prepare another great season. It is still a good season, maybe my opinion biased because Masahiro Inoue double tokusatsu role. A bit disappointing they didn't explain anything about title Kami no Kiba though. Without spoiling anything for you, the movie makes it clear what "Kami no Kiba" is. It has no relevance to the series though. At least I understood the Kiba Gaiden. It's the first series from the villain's point of view. That's not a bad idea for a clip-show recap special, though it doesn't really offer anything if you'd already seen the series. This, on the other hand, is meant to be a continuation of Jinga and Amily's stories, and I have no idea what they were attempting to do other than rule out the possibility of him ever getting to fight Ryuga again. No, not that thing from Movie. Jinga himself noted that thing's name is familiar because he remember his past self title. In Makai Retsuden, Amily immediately recall name Kami no Kiba after Jinga introduce himself and that make him flattered so I guess it is not his Knight title like Gold Knight or Silver Fang Knight or Flaming Sword Knight, etc. I mean why he should embarassed when someone just saying your own knight title. Most knight even boasting about those title to horror. This series and that movie deliberately use that name as title, the Movie subtly use that name to tease past use of that name while the series have nothing at all. Not even connected with Kami no Kiba from Movie, except if they gather those horror for its sacrifice but it seem they just enjoy their own rebirth. The show could have used a bit more development for its characters. I like the reincarnation concept of Jinga a lot. But the show becomes hard to follow after a while. If Mikage Jinga is a reincarnation of the old Jinga, how is the latter still within him, unless he "awoke" the remnant of his past life? When Fusa asked Youyu for the Horror revealing spell, did she really mean to test Touma, or did she suspect Jinga even then? It seems by the show's end that it was the former, but I was still left confused. There doesn't seem to be much point for this story, especially as it ends on such a downer. And what as that golden shining thing in the cave in the last scene?